To celebrate President Obama having just reached the same milestone birthday as myself, I decided to feature my Obama 2008 Presidential Campaign wristbands. When I was walking around the house looking for something to photograph them with, I noticed that an empty jam jar in the cupboard was basically exactly the same size as the wristbands, and then once I had the jam jar I needed something to put in it, and so I added some red tea roses, white jasmine, and blue borage flowers from my backyard, and then returning to the kitchen added one birthday candle for each decade. Happy birthday, President Obama! During the months leading up to the 2008 primary elections I had donated money to both Barack Obama and Hillary Clinton, but once Obama became the Democratic candidate, among other things I did my usual walking-billboard thing of getting multiple kinds of Obama 2008 T-shirts (including this “Obama Pride” one) and wearing one or another of them every single day until election day (plus the day after, to celebrate his victory). And I got two each of the three kinds of official Obama 2008 wristbands (or bracelets, as they were billed) from http://store.barackobama.com/ (though as you can imagine it’s now selling 2012 wristbands rather than 2008 — more about that down below). 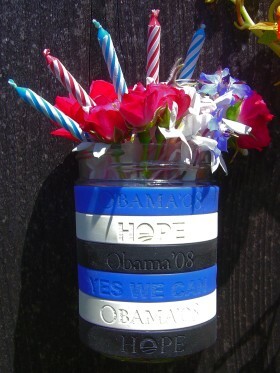 As you can see on this page, each color of wristband is imprinted with “OBAMA ’08″ on one side, with “YES WE CAN” on the other side of the royal blue ones, and “HOPE” (with the Obama “O” logo for the “O”) on the other sides of the black and the white ones. I wore the wristbands all over the place, and got many compliments on them, and conversations sparked by both the wristbands and my T-shirt collection. I remember talking with a school speech therapist who also had some of the wristbands but wasn’t able to wear them on the job due to a no-campaigning rule — then after the election she proudly wore them to work and showed them to me. This is kind of an odd point to bring up considering that wristbands in general, and election-year ones like these in particular, are intended to be cheap, colorful expressions of a message and a moment, not some kind of lasting heirlooms, but these are just about the best wristbands ever, in terms of material and printing quality. Some wristbands crack, fade, or become discolored over the years, or are kind of crudely printed, but these ones are really high-quality in terms of material, colorfastness, and the detail of the imprinting. Post-2008-election, I’ve continued to wear them now and then, sometimes to political events and sometimes just for the colors. I had been looking forward to the Obama store getting Obama 2012 wristbands as we got closer to the election, but now (February, 2012) that they just did, I don’t really think that much of them: Instead of being obvious campaign wristbands like the 2008 ones with their “2008″ and election slogans, as shown above these new ones just say “Obama Biden” and “Greater Together” in a small, generic-looking font. OK, so maybe Obama and Biden are greater together, or we and they are greater together, but they could at least say “2012″! Anyway, you can get the set of three shown above for $10, or an individual black, blue, or white wristband for $5. Being as the election is just weeks away at this point, use the coupon code LASTCALL for 30% off all purchases of $10 or more. In the same vein, Obamavolunteers.com has marked down all of their Obama shirts, signs, buttons, and bumper stickers to only a dollar a piece. Well, now that the calendar has advanced to my birthday (January 9), and the election is over, in addition to the Obama Store you can check out the Inauguration Store — all sorts of commemorative items, from buttons and shirts to more offbeat things like a ruler and a wooden toy limousine to more pricey choices like medals and framed posters. Enter the code 2013 to get %15 off your purchases of $10 or more. Some of you might be wondering why I would continue to support President Obama, considering that the economy is a wreck and that many of his campaign promises have yet to be carried out. Well, on one hand carrying out his campaign promises has been a tremendous uphill battle considering that a large number of the Republicans in congress are committed to trying to block anything Obama supports, even if it’s some of the same things recent Republican presidents had supported, or that they themselves had very publicly supported in previous years. Some of these Republicans in congress have even come right out and said that their number-one priority is not to represent their constituents or serve their country but rather to make Obama a one-term president. The Obama store even has a new “CHANGE IS” T-shirt with a picture of President Obama on the front and a timeline of some of his accomplishments on the back, plus sets of “Accomplishment Cards” listing “information about many of President Obama’s key accomplishments so far”. I want Obama to have a second term so he will be able to continue to build on these accomplishments, and to fill any Supreme Court vacancies with justices who will defend the rights of the people rather than the money of the corporations. Therefore I continue to support President Obama, and encourage others to do so as well. I sent the Cherie Welch Republicans 2012 keeping millions out of work to put one man out of a job on a note I sent around to a liberal group that meets monthly in Fairhope , Alabama and have had two people to ask if they have that as a bumper sticker, found your site and thought I would check with you to see if you know if they have that as a bumper sticker. So I still don’t know! 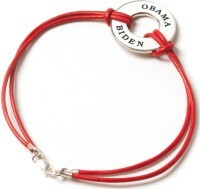 I’m trying to find a red leather obama biden bracelet but the official store no longer carries them. Any suggestions as to where I can find one? Thanks! I know they were still carrying them the last time I was checking links, but yeah, when I tried just now I got a “not found” page, and they don’t seem to have just changed the URL as sometimes happens. 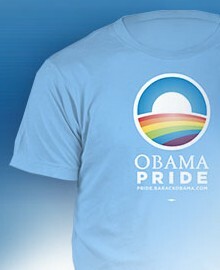 I would say, send email to the Obama store asking if they might still have one around somewhere, or if they’re going to be getting them back in stock. Or if a navy version would be OK, I guess you could get this necklace version of the bracelet and just loop it around your wrist multiple times. Previous post: Love Your Body!